Prime rib is a classic holiday recipe and one of the most popular roast beef preparations in the culinary arts. Prime rib is a roast cut from the beef rib primal cut, traditionally (but not exclusively) with the rib bones still attached. The perfect prime rib is juicy, medium rare and has a flavorful, brown crust on the outside. Also, when you slice it, you don't want to see very much gray meat near the edges. Ideally, you'll see just lovely pink meat all the way across. Below we'll offer four different methods for cooking a perfect prime rib roast. It's natural to be a bit intimidated by a big piece of meat. After all, it's an expensive meat cut, and the holidays are already stressful. But fortunately, the procedure for roasting a perfect prime rib is actually pretty simple, so you can get the roast in the oven and move onto other delicious things—like the sides! Boneless or Bone-In Prime Rib? You can roast a prime rib with the rib bones still attached or you can have your butcher remove the ribs. Note that if you do this, he's going to weigh the roast first and then take the ribs off. In other words, you're paying for the ribs either way. So be sure to take them home with you as they are great for making stock or sauce. And speaking of sauce, here's a basic au jus recipe that's a classic accompaniment for a roasted prime rib. You might also like a creamy horseradish sauce to add to your dish. Any of the techniques below will work for either a bone-in or boneless prime rib. In each case, you're going to need a digital probe thermometer that lets you set a temperature alert. You'll also need a large roasting pan with a rack and some cooking twine for tying up the roast. Although you could certainly just ask your butcher to tie it for you. If you're roasting a bone-in prime rib, the rib bones can function serve as a natural roasting rack, and by that I mean they create a space under the roast for hot air to circulate. But if you've got a pan with a rack, you might as well use the rack. It'll create even more airspace and help the roast cook more evenly. The Traditional Prime Rib: Probably the most typical way of roasting a prime rib, and the best method for larger cuts (i.e. 11 pounds and up). Start the roast at 450 F, then lower it to 325 F to finish cooking. The Slow-Roast Prime Rib: With this method, brown the prime rib on the stovetop before cooking it in the oven at a low temperature. 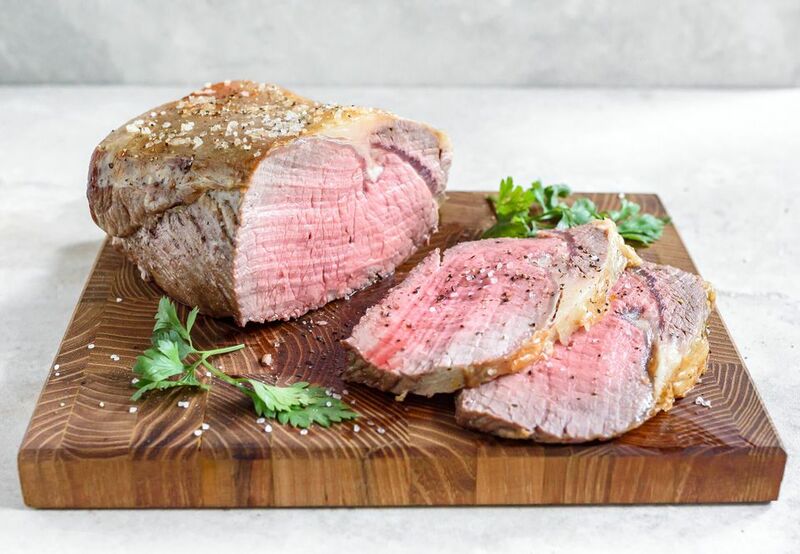 The Sear-Last Prime Rib: A variation of the slow roast method in which you slow roast the rib, let it rest, and then stick it back in the oven at a high temperature immediately before serving. The Closed-Oven Prime Rib: This method is best for smaller roasts (up to 8 pounds). It uses a little bit of math to calculate the roasting time, but it's a fairly simple recipe.